September, and we’re halfway between the longest day and the shortest, or between Midsummer and Christmas, with the Autumnal Equinox at 02:54 on the 23rd (although the day when day and night are closest to equal is the 25th). If you’ve a good view of the south-western horizon, you may still catch a brief glimpse of Venus, very low in the glow of the sunset. There will be a very slim crescent Moon just above on the 12th but you will need a keen eye. I think we can say goodbye to the silvery planet in our evening skies for this year. Jupiter doesn’t fare much better as it too sets not long after the Sun. At least it is a little higher in the sky. The Moon is above and to the left on the 14th. Interesting to notice how close Venus and Jupiter got before they disappeared, hand in hand, into the sunset. As soon as the sky starts to properly darken, Saturn takes centre stage in the south at the same altitude as Jupiter. This most wonderful object to see through a telescope has had only a minor role this year, being outshone by all the other planets. The Moon gives it a brief cuddle on the 17th. Then to the left and closer to the horizon, we have the star of the show and the cause of Saturn’s diminution, Mars. It really has been spectacular, having swung close to the Earth in its orbit. It continues to be really bright with its orange colour very obvious even though we are moving away from it now in our smaller, faster orbit. A big, bright Moon is close by on the 19th and 20th. 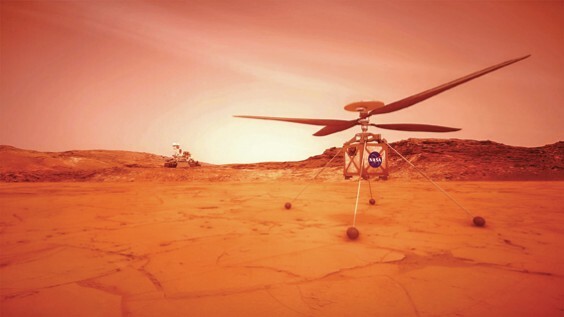 Interesting to see that NASA is hoping to develop a helicopter for use on Mars. As the atmosphere there is equivalent to 100,000 feet here on Earth, the rotors will have to spin at amazing speeds to generate enough lift. It is scheduled to accompany the next rover to be launched to the red planet in 2020. Closer to Earth, Japan launches the “Kounotori7” HTV-7 cargo vessel to the ISS on the 14th. If the Space Station is visible at this time, look for a small satellite just ahead of it at this time. As ever, http://www.heavens-above.com is the site to consult. When the sky is properly dark, Jupiter is long gone – and in Greek mythology Jupiter, known to them as Zeus, also disappeared on one occasion. You see, he had taken rather a shine to the wife of another: a beautiful lady called Leda, and in order to, er. . . pay her a visit, he transformed himself into a swan. He’s there now, high overhead, visible as a cross of stars flying along the Milky Way with one of the most luminous stars in our galaxy, Deneb, on his tail.